On a saturday afternoon, I decided to grab lunch at Food Republic. I've heard quite a good number of reviews about the huge XL chicken or pork cutlet and decided to give it a try. There was no queue and I got my noodles before I could even pay the auntie. The auntie at the cashier was super friendly and encouraged me to try both pork and chicken cutlet. I guess for $6.20, it's reasonable. The noodles were good, my friens visiting from Japan couldn't get enough of it. The chicken cutlet, was dry and very oily. 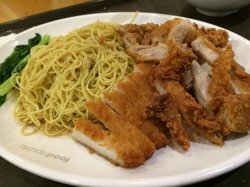 The pork cutlet was very oily but at least crispy. The saddest part is there is toast box right across from this stall selling chicken cutlet noodles and their chicken cutlet with a drizzle of cheese sauce was a lot more tender than the chicken cutlet here. Overhyped, but at least the noodles were good. 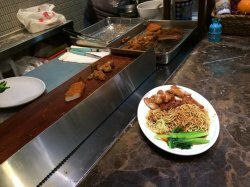 Just when I thought foodcourt fare has reached the point of hopelessness, that it compromises taste for profitability, I came across Red Ring Treasures @ Wisma Atria Food Republic. Its relatively new an outlet, having just opened sometime mid 2014. Prices are very reasonable for a stall situated in the heart of town and the taste… I’m won. The highlight of the meal to me is their Onion Blossom. I ordered it out of curiosity. I seen it at restaurants, pubs but being adverse to onion, it never justified me ordering it. 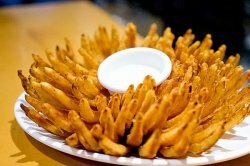 First of all, the onion blossom served resembled a gorgeous golden flower. Fried perfectly, not a single burnt spot. Unlike some under cooked onion rings, these are timed just right such that the onion is sweet yet retaining some crunch. The noodles had a good bite to it. Not too dry or soggy. 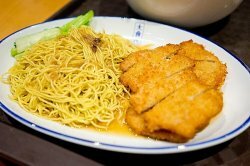 I like that the pork cutlet doesn’t taste too greasy, or smell like stale oil. On hindsight, I probably should have added some chili to the noodles as the taste, though good, tends to plateau after afew bites. A huge bowlful of soup, the dumplings were well made. 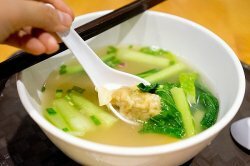 Its pillowy and soft to the bite, the thinly skinned dumpling encased a robust core which falls apart when you eat it. I eat my words. 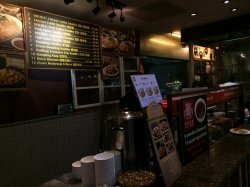 Foodcourts does indeed have restaurant quality food at very reasonable prices. When I come across a gem like this, I feel excited about sharing it.